Here at we firmly believe that gardening is for everyone! So whether you're a seasoned professional or you're just getting started, we've put together a range of easy-to-read guides that contain detailed planting and growing advice, as well as all of our top hints and tips, to ensure you get the best out of your plants. The following care guide should provide you with all of the basic info that you need to help your lovely plants thrive. We've gone into as much detail as possible in order to help you, but if you don't find what you're looking for or you need a specific question answering, please don't hesitate to contact us - details are below. What to do straight away when your order arrives. How to care for anything supplied "bare-root", including Fruit Trees, Roses, Shrubs, Blackberries & Raspberries. What to do with anything that arrives in a pot! Simple instructions - bulbs are very easy to grow! Including full details of our plant sizes and how to grow you plugs on. A full planting guide so you can grow your best ever basket displays! Information on "chitting", planting, harvesting and our fantastic grow your own kits. How to grow your own delicious strawberries! Notes on planting Oleander, Palms, Cypresses, Olives, Citrus fruits and more - including how to protect your plants during cold weather. How to plant, grow, cut back and divide our Cottage Garden classics. Gardening can be a confusion of technical terms for novices and even the more experienced of us! We've listed a few key meanings to help. When your order arrives, unpack it carefully and check the plants inside. Our coureirs are asked to leave orders in a safe place and leave a note if there is no answer at the door, so there's no need to wait in. If the outer box appears crushed or damaged in any way, please still open the box, as the plants will more than likely be fine. Our packaging is specially designed to be able to take a beating in order to protect the plants inside and most plants are much tougher than they look! There will be a Dispatch Note enclosed with your order, telling you what you have. Sometimes we split orders as some items can't go in a box together, or by the same courier route. You should have everything that is listed on the Dispatch Note - if you don't, get in touch. Bare-root plants are dormant, with no leaves, and with the roots out of the soil. The season runs from November to April, depending on weather. Some larger or slower-growing plants will already be a few years old on supply, and ready to thrive straight away in your garden. Select an appropriate spot for your plants, making sure that you give them enough space to grow to their full size. Dig a hole twice the width of the roots, forking over the bottom to loosen the soil, and add some good quality fertiliser such as Blood Fish & Bone (wash your hands afterwards!). Aim to plant at the same depth as the soil mark on the trunk. Holding the tree or plant upright in position with one hand, slowly backfill the hole with soil, and gently shake the plant, so the soil falls back around the roots. 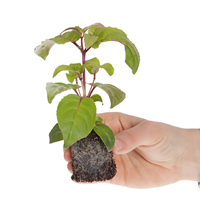 Use your heel to compact the soil around the plant to ensure good contact around the roots. If you're planting into pots, place some old rocks, stones or gravel in the bottom of the pot for drainage and ballast. Use the best compost you can buy - our Premium Professional Compost mix is particularly good - and some sand or grit to aid drainage. You are again aiming to plant to the depth of the soil mark. Firm down as you fill, and press down hard with your heel when the pot is full. For all trees, we highly recommend using our Tree Planting Kits. Each contains 3 tanalised wooden tree stakes, 3 soft rubber tree ties and a sachet of Root Boost Mycorhizal granules. You only need to support the bottom half of each trunk, so push 40cm of each stake into the soil next to each tree. With the soft tie, make a figure of eight around both the trunk and stake, and fasten it off. The tree will now be better protected from strong winds. Root Boost contains millions of Mycorrhizal fungi which will colonise the roots of bare-root plants - proven to aid root growth, leading to better, quicker establishment and improved health. Spread this on the roots and in the soil when planting, and ensure that it is in close contact with the roots. Water the plants weekly - especially in dry weather - for the first 8 weeks or so. When the soil and air warm up from late March onwards, you should see the plant burst into life. Do not allow plants to dry out in the first four months after planting. Once established for one season, they will become much more tolerant to a lack of water, as the root system develops. There is no real need to prune for the first two years. Whilst a lot is talked about pruning, the best advice is to prune to the shape and size you want. Remove any broken, diseased or crossing branches in late autumn or winter once the plants are well-established to control size. Prune established trees in summer using good quality secateurs (we highly recommend our exclusive Fieldhaus ones), removing weak shoots, and cutting out those that cross over each other, to create an evenly spaced bowl shape. We graft fruit varieties specially picked to produce great crops of great-tasting, juicy fruit onto a "rootstock" of another variety, that is chosen because it will grow very well, but remain compact in size. Info on rootstocks is available on our product pages. "Dwarfing" rootstocks mean that anyone can grow their own fruit trees even in the smallest of gardens, or even on a small patio! Fruit production is dependent on a few factors, such as the weather and pollination by insects. Some trees are self-fertile, whilst others will require a pollinator in order to produce fruit - see our website for details. As your trees establish your crops will improve. It is quite common for stone fruits such as plums, cherries and peaches to only produce flowers and fruit every two or three years. Even if you have lots of flowers, you still need them to be pollinated by insects before the fruit can be produced. You can "cheat" by using an artist's paintbrush to brush from flower to flower when they are produced in spring, mimicking a pollinating insect. You may just prefer to let nature take its course though. Pruning in summer after the fruit has set will encourage more fruit growth the following year. If you want to encourage your tree to grow, the best time to prune is autumn/winter. It is advisable to prune stone fruits (such as plums, cherries, apricots and peaches) only when they are in leaf, to avoid a condition called "Silver Leaf". One of my trees has not grown/looks dead. What should I do? Scratch back a small section of the branch with a thumbnail or sharp knife. It comes away easily. If underneath it is green, the tree is fine, and just needs more time and warmer weather. If it is brown, the tree is dead at that point. Sometimes the tips of smaller branches will die back, but the tree is OK. If you find a brown branch, move closer to the main trunk and repeat, and check the trunk itself. If you find green lower down, prune back to where you find green, and it will shoot from there. If it is still brown, or the main trunk is brown, the tree is unfortunately dead. It is perfectly normal for stone fruits (plum/apricot/cherry etc.) to take longer to burst back into life than other fruits like apples and pears; this is because they need warmer weather. The leaves on my peach tree are deformed and discoloured. What has caused this/what can I do? It is almost certain to be Peach Leaf Curl, which is caused by airborne bacteria (it has not come from us!). It affects peaches, causing the leaves to roll up with red/orange coloured blisters. It is prevalent in wet springs and the last few years we have had have been classics for it. It is cosmetic, so will not kill the tree, but affected leaves will slow growth. Remove any affected leaves and destroy them. Keep your tree well-watered as they can use a lot of water - especially in warm breezy weather. Cover the tree with Bordeaux Mixture periodically throughout the year, to protect new buds that grow. The tree should be fine. More info is available on the RHS website via this link. My Pear tree has lots of brown/orange spots on the leaves. What has caused this/what can I do? A classic example of Pear Tree Rust - a fairly common fungal infection. The RHS's website has lots of useful info on this infection available here. It is rarely fatal to trees, though it can reduce fruit yield. What is unusual about Pear Rust is that the fungus attacks both Pears and Junipers. It actually needs both plants in order to complete its life cycle. Does the customer have infected Juniper conifers nearby? It is advisable to remove and destroy infected leaves. There is also more advice on recommended control of the disease on the page above. The fungicide difenoconazole (Westland Plant Rescue Fungus Control concentrate) is labelled to control pear rust. Rose bushes often have a bad reputation for being difficult to grow. Over the last couple of decades however, there have been many breeding advances which have greatly improved performance. We have chosen proven-varieties that are guaranteed to perform in your garden, have a high resistance to common diseases, but most of all have brilliant flowering displays and produce superb fragrances. We sell a wide range of rose bushes, including bush-roses, climbers, ground-cover roses, and standard roses. There is a wide variety of colours, scents and other characteristics - full details on each relevant product page. Roses are supplied either in pots, or as trimmed, dormant bare-root bushes (between October and April). In both cases they are ready for planting on receipt. When planting, use our Rose & Shrub Feed instead of Fish Blood & Bone. Roses should be planted about 1-1.2m (3-4ft) apart, although they can be pruned to size quite easily. You should prune roses annually in early spring, before the new growth starts. Remove old and thin stems, cutting them down by about 60%, using good quality secateurs. Raspberries and blackberries are very easy to grow in different varieties of soil and partial sun, even in small spaces. They are low maintenance yet highly rewarding. We are associated with Europe's largest and leading raspberry plants ("canes") producer. The plants are grown on the sandy fens of Norfolk and are the best quality you can buy! Plant 60cm (2ft) in rows, along walls or fences, or in beds, where further support from posts may be needed. They can also be grown in large pots (40cm+ diameter), potting 3 - 5 canes around the edges. Water in well after planting. Cut down any raspberry canes that have already fruited in November, leaving long canes for the following year's bigger crops. Summer-fruiting varieties crop in July on last year's growth, so when their season finishes cut down the fruiting stems. New shoots will soon emerge, and next year's fruit will be produced on these one-year-old, ripened canes - do not cut these down, as they will provide the fruit next season. If you would appreciate fresh raspberries over a long season, grow at least one summer and one autumn variety of raspberry bushes. Spring is the best time to prune blackberry bushes. The canes usually grow one season; produce fruit the next season, then die. Once the canes have fruited and died, they should be cut back to just above the ground. The majority of trees and shrubs that we supply are deciduous - the leaves fade and drop off in autumn, and re-grow again in spring. Between October and March, they are most likely to be dormant and can look a little like "dead twigs" - don't worry, this is completely normal. Potted plants can be planted all-year-round and if you can't plant straight away they can be left in their pots for as long as you need. You're fine to keep them outside as long as they are well-watered and kept frost free. Plant the same as you would bare-root plants - instead of digging a hole to fit the roots, dig one to fit the pot! More information on Mediterranean or exotic plants can be found below. Your bulbs will be packed in perforated polythene bags. If you cannot plant them straight away, keep them in a cool, dark, moisture-free place and they'll keep for a few weeks with no problems. If they've been delayed in the post, don't worry, as they are fine in transit for a number of days. Whether planting into pots, containers or straight into the ground, there is a simple rule of thumb for planting - plant bulbs at twice the depth of the height of each one, and approx. 4 times their width apart. For example, 5cm tall bulbs would need to be planted 10cm below the surface, and 20cm apart. Please check the perforated polythene bag the bulbs are packed in for any specific instructions. They are fine to plant even if a little green growth is starting to appear. They'll just need a good watering when you plant them, and then only when the soil is dry. Whilst all the energy that a bulb needs in order to grow is stored in the bulb itself, they will do better if you feed them when in active green growth. Leave them in the ground once they die back - they'll come back bigger and better each year. We sell Snowdrops, Bluebells and Aconites "in the green". When the plants are in leaf - and later may have flowered and are dying back - they are lifted from the ground, with the leaves still on the plants. They can look yellowing or dying on receipt, which is fine - they will just die back to the bulb. If lifted, packed, sent, and re-planted in a short amount of time, the plants will thrive in their new position. These bulbs establish much quicker than dry bulbs, so you can expect full flowering displays the season after planting. We sell a wide range of basket and bedding plants in four different sizes, as detailed below and on our website for each product. The vast majority of plugs will be annual plants to create seasonal displays in flower beds, borders, hanging baskets and pots. These can loosely be split into "summer" or "winter" categories, but in truth, many may flower for six months or longer. Trays of small plants. Will need potting on for 4-5 weeks before planting out. Can go into pots straight away. Larger sized plug plants. Can be potted into pots straight away, but we advise growing on for 3-4 weeks before planting into hanging baskets. Very large plugs or trayplants. Ready to plant straight into the garden. For mixed collections, the blister packs or "mini-greenhouses" will have a label on the outside, listing the individual varieties inside, and referring to the embossed "A, B, C" etc. on each cell of the packaging. Unpack plugs immediately, and stand them in water for an hour. They may be slightly dry, or look a bit yellow - this is quite normal after they've been in the dark for a couple of days and they'll quickly recover. Put them somewhere light, airy and not too hot or cold, to help them acclimatise to life outside the greenhouse. When potting on ("pricking out"), handle plugs carefully - even though they're tougher than they look! For small plug plants in trays, push them out using a suitable small instrument through the hole in the bottom of each cell - e.g. a "dibber" or a pencil. Pot on using our Windowsill Planters or Shuttle Trays with 9cm Pots, using good multipurpose compost like our Premium Professional mix. This will allow them to grow healthy rootballs before you plant them out. Give your plants a good water initially, then only when the top compost starts to dry. They don't like to be left in standing water. If planting directly in to flower beds, prepare the ground well, removing weeds and digging in some compost or well-rotted manure if your soil is not already rich. For beds, borders and containers, plant your plugs approx. 20cm (8") apart to allow them room to grow. We recommend using our Easy Fill Hanging Baskets for the very best hanging basket displays. Plant 1 grown on plant through each planting hole, using good quality compost and our excellent SwellGel & Feed. A full video planting guide is available through the Garden Gargains YouTube channel. Feed using a high-potash feed such as McDermott's Finest Fertiliser for Flowers & Fruits, to encourage flowering. Dead-head when flowers fade to encourage more flowers. Easy Fill Hanging Baskets create instant impact from the moment they are planted up! We recommend planting grown-on plants and using McDermott's SwellGel & Feed, and our Premium Professional Compost for best results. We have a wide range of plants that are perfect for planting into Easy Fills throughout the year. A 15" Easy Fill basket has room for 17 plants - one in each hole and 5 plants, evenly spaced on top. The smaller 12" baskets hold 9 - one in each hole and 4 on top. Firstly, get a medium sized plant pot and place it on a table/potting bench, and then place your Easy Fill basket on top. This will allow you to easily turn the basket, preventing plant damage. Put the couple of handfuls of compost (to the level of the first planting holes) and a sprinkling of SwellGel & Feed into the bottom of the basket. Then get one of your plants, and feed it through the first planting hole, so that the roots and any soil are inside the basket, and the foliage is on the outside. There are some "Lattice Gates" in the box with your baskets. These clip into the planting holes of the basket to hold your plants in place. From the outside, place the gate over the planting hole - being careful not to trap any leaves - then click it into place. This will hold the plant with the roots inside and the leaves and flowers outside - in both cases perfectly unharmed! Repeat this process until all of the planting holes are planted up, adding more compost and another Sprinkling of SwellGel & Feed as you go. Create a mound of compost on top of your basket, then plant more plants here too. A 15" basket has room for 4 plants around the outside plus one in the middle. Finally, all you need to do is hang your basket up. You'll notice a 4-Point chain in the box for each basket. Feed the chain through the apertures built into the rim of the basket, and then click the anchor on the end of the each chain into place. This will lock them in, so your basket will be safe and secure. Water in your plants well, then as they need it, and then sit back and watch your plants grow into incredible displays - the best you've ever grown! Any gardener will be able to tell you how satisfying it is to be able to dig up and eat your own home grown veg. Potatoes are one of the most common vegetables to grow. They are easy to plant and take very little effort to look after and therefore it is easy to get a good crop of them. Our Patio Potato Kits are a cheap and fuss-free way to get reliable crops of fresh potatoes from your own garden, in the minimum of space. They include pots, fertiliser and different varieties of seed potato. We also sell separate packs of seed potatoes. As you may imagine, our delicious strawberries are very popular across spring and summer - you'll never taste better than home-grown strawberries! These are supplied either as "runners", which are small bare-rooted plants, or as "trayplants", with a root ball of compost. We also sell some plants in 9cm pots. Plant strawberries as soon as possible on receipt - if you have runners you'll need to soak them for a couple of hours first. They can be planted in the ground, in tubs or pots, or in grow bags. Plant about 20-25cm apart in rows, or one plant per medium-sized pot. Make sure strawberries are well-watered - particularly in dry springs. They will crop in the first season after planting - often as little as 60 days after planting - and for around 4 years afterwards. Each plant throws out more runners in summer. Cut these off, so the plants focus on putting energy into fruit. Feed with high-Potash feed when flowers appear, which helps set and swell more fruits. We stock some unusual and fun strawberry varieties - including Alpines, Pineberry and Framberry - which can all be grown in the same way. For best results, Pineberries will need a pollinator plant - which we supply. We sell a wide range of Mediterranean and exotic plants, for something a bit special for your garden. Many are much easier to grow than most people think - they're quite low maintenance when established, and are actually much hardier then they look, and they will thrive in the UK if given the proper care. The vast majority are supplied as established potted plants, which are ready to plant out straight away. When your plants arrive, unpack them carefully and check them. If you cannot plant them straight away, keep them somewhere sheltered and frost-free, such as a conservatory, garage or greenhouse. You'll need to plant most of these plants within a couple of days of receipt. We recommend growing these plants in large pots as this will help to warm their roots - aiding growth. It will also enable you to move them to a garage, greenhouse, or anywhere else that will offer protection from frost or very low temperatures. Not only that, they will look great in pots too! Plant your plants into large pots that are 25cm or more in diameter. In a few years you may need to re-pot into larger pots if your plants have outgrown them. Use a few stones or crocks at bottom of the pot for weight and to aid drainage. Use good quality compost such as our Premium Professional Compost, firm down well with your heel, and water them in well. Grow them in the warmest, sunniest part of your garden - they are used to much better weather in their home climate! If growing straight in the ground, make sure your soil is well drained as they generally don't like having "wet feet". When planting, add some grit/sand along with compost/organic matter for best results. Feed and water them well in summer - almost all of their growth will be during the summer months - even palms. Whilst these types of plants are very drought tolerant and can survive long periods without water, they will grow much better if well fed and watered in that period. Feed them with a general purpose fertiliser such as Fish, Blood & Bone. With the colder winters of the last few years, protecting plants over winter has been important. Move potted plants indoors to a greenhouse, garage or conservatory until the risk of frosts has passed. In most cases, over-wintering them somewhere with little light will not harm your plants - just make sure they don't dry out. If you are growing your plants in the ground, cover them with Fleece Covers to help to increase the plant's temperature, and grow them in warm, sunny spots such as against a south-facing wall. Cover the ground around each plant with a generous covering of mulch, to add an extra layer of protection for the roots. The more established a plant is, the more likely it is to survive harsher weather, so protect your plants well in the first few years. Whilst many plants are quoted as being hardy to a certain temperature - say, -6°C for example - it is generally more complicated than this in practice, as there are a number of factors that will affect a plant's hardiness - such as the age of the plant, moisture, or how recently it was planted. This absolute figure is correct in that they will survive short exposure to this temperature. If exposed to prolonged low temperatures around or below 0°C, the plant will deteriorate. Also, if the soil/compost you've planted it in becomes waterlogged, many "exotic" plants will also struggle. This is often more important than the temperature factor. That said, the plants we supply are all known to thrive in the UK if well looked-after, and will become much more tolerant over the coming years as they establish. Feed and water them well in summer - all their growth will be between May and October. Whilst they are very drought tolerant indeed and can survive long periods without water, they will grow much more if well fed and watered in that period. Oleander can take short exposure to temperatures as low as -5°C, when well-drained and less so if they are planted in wet spots in gardens. However, in winter they do not really grow much so we advise moving them. These are evergreen and will look great all year - perfect for framing a door or path. They're very hardy and don't need protecting from frosts. Younger plants will need sheltering from the worst winds, so for best results use tree stakes and ties to support young trees as they establish. They will not spread as much as other evergreen trees such as Leylandii - so much easier to control. For best results, remove fir-cones as they form - this will keep the plant in best shape. The Date Palms we supply are between 2 and 4 years old. Date Palms may look exotic but they are actually pretty tough. They thrive in the UK and are winter hardy to -6°C, but they will need protection if temperatures drop lower than this or are this low for a prolonged period of time. Grow them in large pots - certainly for the first couple of years - so that you can move them somewhere that will offer protection from frost. New growth will form from the centre of the plant during the summer months. When the outer leaves turn brown and unsightly, chop them off at the base of the leaf using good quality secateurs or loppers. The pineapple-shaped "trunk" seen in photos of mature plants will be formed over 10-20 years from the stumps of leaves that have been removed. We'd recommend the use of Blood Fish & Bone organic fertiliser about once every 3 months, when the temperature is above 5°C. These make excellent decorative bushes - our standard form olives will look excellent framing a front door. They will probably never produce any meaningful fruit in the UK, unless grown under glass - it's just too cold and wet! We buy our lemon and orange trees from Valencia; a Spanish region renowned for its fantastic citrus fruits. Oranges and lemons are relatively easy to grow, and can be very rewarding indeed, and with proper care UK gardeners can produce their own fruits too! Ours are "standard" style trees, supplied fully established in large pots and at least 3 years old. They are fine to be left in their pots if you cannot repot them straight away - just make sure that you keep them warm and well watered. We'd recommend that you grow them in large, well-drained pots, as with other Mediterranean plants. Try to plant them somewhere where there is little variance in temperature. The varieties we supply are hardier than you might imagine - to -5°C. As with all hardy plants this is not an absolute line. They are fine outside from April to October, but will need some protection from frosts in the winter. Fleece covers will provide a lift above outdoor temperature of around 3°C or so, but below -5°C these trees will die. In winter, move your trees to somewhere warmer - ideally somewhere with light, and above 10°C. If you can house them in your house (such as a conservatory), you will have the added benefit of their glorious citrus fragrance filling the room when they are in flower, but take care with central heating, as this will dry them out considerably. Feed them well in summer with citrus feed, as they are sensitive to minor nutrient deficiencies - this is a bit like humans taking vitamin pills! Water them well between May and October, to aid growth. In time, prune back any brown tipped shoots or leaves that may appear using good quality secateurs as they need it. They can be temperamental when the temperature, light or humidity changes rapidly,and they can shed a few leaves or fruitlets quickly. Do not worry, this is quite normal - they are robust trees and will recover. Citrus trees are some of the only ones that produce flowers and fruit at the same time. Fruit can take a full 12 months from setting to harvest, so be patient with your trees. It is natural for plants to set a lot more fruitlets, many of which drop off. The plant will select the strongest few to sustain to harvest. Perennials are plants that will survive for multiple growing seasons, as opposed to Annuals, which survive for one season only. Often, they'll die back considerably, to ground level or even underground during winter. They will re-grow the following season and in general displays will increase year on year. Perennials are a great no-fuss way to bring colour and shape to any garden, and form the backbone of a classic "Cottage Garden" style. They are easy to grow and care for and very rewarding - even for novice gardeners. They represent tremendous value for money, as they cover space well, and over a few years can be chopped up or split to create new "free" plants for you to grow or swap. We supply perennials either as plug plants or as small, established potted plants. Check the package on receipt to make sure you're happy with the plants. Treat them as you would any other plugs or potted plants on receipt. Plant grown-on plants into beds, borders or containers. We recommend larger diameter pots (25cm+) for each plant to allow them room to grow over the years. If growing in borders, space your plants around 45cm apart as a rule of thumb to allow them to grow large enough for maximum impact. Plant using good quality compost such as our Premium Professional mix, mixed with soil. If you have clay soil it is worth adding some sand/grit to aid drainage. Add some organic fertiliser such as Fish Blood and Bone or well-rotted organic matter to aid growth. Perennials are very easy to look after and will provide great displays for many years with minimal effort, the clump of the plant increasing in size. Make sure that they are well-watered during hot or dry spells, but don't overwater them in wetter weather. Apply a light mulch and feed in early spring. It is advisable to cut most perennials back in order to keep them neat and tidy, and also to improve their flowering potential. You may choose to either cut them back in autumn, or spring. Cutting back in autumn will make your garden look tidy for winter, but it removes height and structure - which you may want to keep for winter interest, and also to provide shelter for wildlife - in which case cut back in spring. We'd advise leaving less-hardy perennials such as Penstemon until spring, so that the old stems and foliage can protect the crown of the plant from the worst frosts. When cutting back in spring, cut close to the "crown" of the plant. Take great care to make sure you do not remove any new shoots or damage the crown. The "Chelsea Chop" is often done to taller perennials to improve branching and flowering - done at the time of the Chelsea Flower Show (hence the name!). Your perennials will continue to grow each year. Dividing them will ensure that they continue to grow healthily and perform year after year. As a general rule, plants should be divided when they're dormant, in late autumn or early spring. 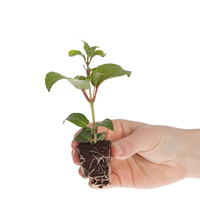 Lift the plant by loosening the soil around the plant, taking care not to damage the roots. Shake off any excess soil, and remove any dead material, then gently divide the roots with a hand fork or spade. Discard any old, woody growth from the centre of the plant and replant the divisions as soon as possible, ensuring that they don't dry out - to the same depth as the original plant, and with enough room to grow. Annuals are plants that will only survive for one growing season. Many bedding plants are examples of annuals - e.g. Busy Lizzies. Most of our fruit trees are supplied this way. It means they are dormant, with no leaves, and with the roots out of the soil - the traditional, best way to supply them. The season for this runs from November to around the end of April, depending on weather. Chitting means encouraging seed potatoes to sprout before planting. Stand them in an egg box in a cool, light room for around 4-6 weeks and shoots will appear from the dark "eyes" on the potatoes. In simple terms, this is the part of a perennial plant where the stem meets the roots. With most plants, this will be roughly at soil level. It is important to protect the crown from disease, frost, or other damage, as this is the part from which the plant will grow. A "Dwarfing" rootstock is a rootstock of a less-vigorous tree, which will limit the eventual height of a plant or tree, without affecting the qualities of the scion. Trees with semi-dwarfing rootstocks will grow slightly larger than those with true dwarf rootstocks. Ericaceous soil or compost is acidic. The pH of the soil is typically between 4.5 and 6. Some plants prefer to have acidic soil, and you can buy specific compost to aid growth. This is the process of inserting tissue from one plant into that of another, to combine one plant's qualities of flowering or fruiting with the roots of another that offers vigour and resilience. The "Graft point" is easily identified as a bulge just above soil level. These are beneficial fungi that have a symbiotic relationship with plant roots. They take sugars from plants and "in return" the fungal strands gather moisture and nutrients from the soil, which is then taken up by the roots. The mycorrhizae greatly increase the absorptive area of a plant, by acting as extensions to the root system. To ensure that plants will remain lush green and healthy looking. Ensures that the plant root systems will be large and healthy, and that the structure of plants is strong and capable of supporting the flowers and/or fruits the plants will carry. Essential for long-lasting, large and colourful flowering displays as well as bumper crops of fruit. Perennials are plants that will survive for multiple growing seasons. Often, they will die back considerably - to ground level or even underground during winter. They will re-grow the following season and in general displays will increase year on year. A pollinator is a similar tree of the same or similar variety. Bees will fly from one flowering tree to another and pollen is passed between them - fertilising the trees. Whilst a lot is talked about specific types of trees, in reality all you need is a variety with a similar flowering time, somewhere near your garden. E.g. a 'Braeburn' apple in your neighbour's garden will pollinate your 'Bramley' apple. Rootstock is the lower part of a plant or tree, with the underground roots and a stem, onto which another plant or tree (commonly called the "Scion") is grafted. The rootstock controls the vigour of the plant. The main tree (most commonly a fruit tree) which is grafted onto a rootstock, giving qualities such as fruiting or flowering potential. This is the variety - e.g. 'Victoria' plum. Self-fertile trees do not require a pollinator tree. When bees move from flower to flower on the same tree, the tree will be pollinated. A standard tree has a long stem and a "lollipop" type ball of foliage on top.